Flaunt your back in style and make every X-Men freak drool over this unusual backpack that has the back of a pangolin backpack. This cool backpack has already made its Hollywood debut in the X-Men franchise, and it’s time for you to take this stylish backpack to a whole new level in your way. Owls never go out of fashion and to all girls out there, time to give your stalkers a real scare with this freaky owl bag. This mini owl backpack is one of the most popular bag packs that exist in the market. Its thin material and sleek design can give any Jimmy Choo article a run for its money. Electric Backpack is an average looking backpack with shockingly awesome features. This high-tech backpack can give all the existing wannabe cool bag packs a big setback. This cool backpack not only allows its user to keep all his electronic gadgets at one place safely but also supports mobility with its sturdy wheels that can take you anywhere with ease. You don’t want your beloved DSLR to get hurt when it contains all those great pics inside its belly. Lowerpro Whisper’s professional camera backpack is a unique backpack that ensures that your camera remains protected. This high-tech backpack comes with multiple pockets crafted exceptionally to accommodate the camera and its different lenses. Allow that cool breeze hug your face and give your helmet a rest without any trouble with this awesome backpack. This trendy backpack is high on utility and low on weight. Motorcycle Travel Backpack is an easy to carry backpack that comes with awesome pouches that can quickly move your heavy stuff like your helmet and laptop with ease. Don’t just roam while you wander outskirts, because it’s time to fly with this lightweight backpack. The backpack looks distinctly out of space and makes you feel super light even if you stuff it to its capacity. This stylish backpack is a must-have for folks who spend most of their time outskirts. Time to reveal your inner Iron Man through your back with this cool backpack for kids. This stylish backpack has in build LED lights and comes in the shape of an iron man’s helmet. This cool Ironman LED Backpack has marvelous perks of its own and is a must-have for school goers. Touch me at your own risk for I have got some severe spikes on my backpack. That’s what biodomes backpack is all about. Catch the attention of all the subway people with this trendy backpack that makes a style statement of its own. This cool backpack is undoubtedly one of the funniest backpacks in the market for its reasons. Vroom your way through heavy or mild traffic without worrying about your stuff with this scooter backpack. This cool backpack for adults is not only trendy but is pretty high on utility as well. It’s an awesome backpack that never goes out of trend and keeps grabbing eyeballs wherever it goes. Time for the world to show you some respect and what better than a fire-breathing dragon on your back can help you to earn that? While to some, Dragon Backpack may look like an unusual backpack, this product is probably one of the most popular backpacks that you can get. Why hide your assets when you got everything covered? This cool backpack allows you to bare it all without getting noticed by even the cringiest of eyeballs. The undercover Backpack is a multipurpose backpack that allows you to change your clothes in a public place without any chagrin. Carry wheels on your back while they are not on the ground with this cool and unique backpack. 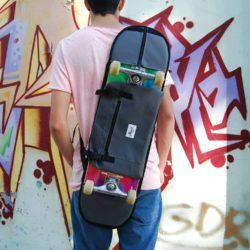 Skateboard Shoulder Backpack is a multipurpose backpack that can comfortably accommodate skateboards along with your daily need items. Stack all your valuables into this cool backpack and now roam around freely anywhere in the world without being concerned about your stuff in this cool backpack. With Bobby Anti-Theft Backpack, you can bid farewell to your travel worries and use Bobby Anti Theft high-tech bag pack to enjoy your trips in a cool manner. This list of backpacks will help you forget about your last favorite backpack. Just browse through my list of 17 unique and coolest backpacks for adults that will make you the style icon.